It's not often when researching the beginnings of Europe's Germanic tribes in Scandinavia that the study of a single tribe can lead to the discovery of wars between humans, gods, and giants, but that's precisely what happens with the Jutes. Famous for their migration to Britain during the fifth century AD and their take-over of Kent, the Germanic tribal grouping of the Jutes has been the subject of much study. A mysterious group, their origins are unrecorded, but they are known by many apparent forms of their name, from Eudoses and Eote to Ytene, Yte, or even Iutae in various ancient sources. Modern scholars have also produced Uitones and Heutones (both of which are possible mistranscriptions of another tribe called the Nuitones). The meaning behind that name has been open to speculation. In the original form, the name probably means 'giants', seemingly a reference to their height and stature. Such a physical distinction, pronounced enough to give the group their very name, must have been produced by circumstances which were outside the experience of most other proto-Germanic groups in their homeland of southern Scandinavia and the Cimbric Peninsula. To produce such a distinction, it seems most likely that the Jutes were in fact a high-altitude tribe. 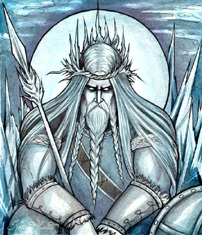 The theory is that they would have emerged from beyond the Alfheim region in the eponymous Jotunheim mountains (during the Viking Age, Alfheim formed a petty state of its own). The Indo-European proto-Germanics arrived in Scandinavia roughly between 2500-2000 BC (see the feature, Indo-European Daughter Languages: Germanic, via the sidebar link). They would have had at least two thousand years to get used to their new homeland before they began to enter the historical record. Darwinism would have ensured a tall, hardy stock of men for such a demanding mountain landscape as that envisaged for the Jutes, earning them their name - 'the giants' - and providing the legendary name for Jötunheimr, the home of the giants in Norse mythology. This location places them on the border between modern Norway and Sweden, with direct access to the Skagerrak, the straight between southern Norway and Sweden on one side and Denmark on the other. This in turn gave them access to the Baltic Sea along which they migrated to reach the southern Baltic coastline of what is now eastern Germany. From there they migrated westwards into the Cimbric Peninsula to give their name to Jutland. That migration is about the earliest event known for the Jutes in ancient records. If Jötunheimr and the Jutes are one and the same homeland and people, then only the precise location of the homeland needs to be discussed. It cannot be confirmed as being the Alfheim region, of course, but everything is right for them to be placed there. Other mountain locations with Baltic Sea access are no doubt also available. Once we have Jotunheimr as a location, even if the precise location is open to debate, then we can place the giants of Jötunheimr in southern Scandinavia. In Norse mythology the giants fought the humans of Midgard and the gods of Asgard. Clearly the Asgardians are just a bunch of warrior humans by another name, probably very famous ones for their time who were later immortalised via oral tradition. The Jutes themselves may have been more powerful than they were in the fifth century AD. After all, they retained their identity while migrating out of Scandinavia, traversing the length of the Baltic Sea, traversing back towards the west via the southern Baltic coast, and then finding a home in Jutland. They appear to have dominated there until the arrival of the Danes. But why did they leave in the first place? Did they do it for reasons of over-population or because they were pushed out? Did the Jutes and the Swedes or Norse fight it out at one point in unrecorded prehistory to decide who dominated southern Scandinavia? If the Jutes come from Jotunheimr, and the Asgardians are a powerful warrior tribe then it seems that they did. In fact, the name Asgard describes little more than a tribal settlement centre, an enclosure, probably with a bank and ditch and probably also with a wooden palisade. The As are simply another Scandinavian tribe (albeit a powerful one). This name, As or Os, is itself a contraction of Asura. In mythology the Æsir (Oson) fought the Vanir (Wanon), both of which are plural forms of As/Os and Van/Wan. These battles took place early in mythology and the As were victorious. See the feature, Original Indo-European Names [not yet available], for more discussion about Asuras, Os, and Æsir. The influence of the As and Os are clearly visible in the formation of the Azeri name, revealing an Indo-Iranian influence on the Turkic tribes. The Wan tribe seem most likely to have been either Finns or Venedi. That leaves rather a large field of potential conflict as the Finns and Kvens occupied south and northern Scandinavia respectively, while the Venedi are suspected to have occupied vast swathes of Eastern Europe along the line of the Vistula and possibly westwards along the border with the early Germanic groups. Perhaps given the location of the As in Scandinavia, the Finns are the best option. They were well established, having arrived as much as a millennium before the Germanics, and the struggle for dominance is well documented in the Norse sagas. The war between As and Van was ancient history by the time the sagas were written down. An important part of that conflict was the battles against the giants - the Jutes - and it included at least one very recognisable name - that of Wotan, the origin of the Norse Odin. 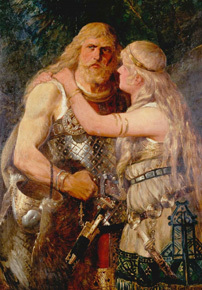 Wotan was so important a figure that he was included in the genealogy of just about every Germanic tribe which could string together a convincing family tree. 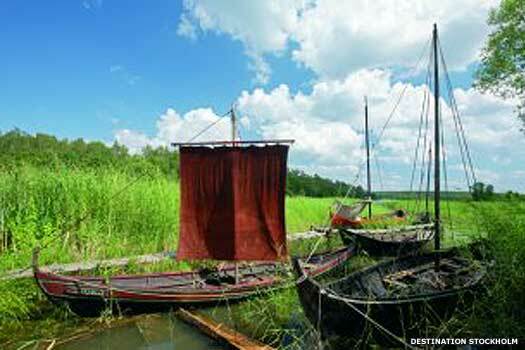 The Roman historians, Pomponius Mela and Pliny the Elder, named the Baltic Sea the 'Codanus Sinus' (Codan waterway), which is the deity form 'Godan', of which Wotan is a cognate, and the tribal name 'Goth' is also a cognate. Perhaps surprisingly therefore, 'Codanus' equates either to 'Wotan' or 'Goth'. That places him as a newer arrival or honoured personage of note among the Æsir (Asuras). These Æsir, as any fan of Marvel comics will know, also include Thor amongst their number, the great thunder god. He seems to be derived from Taranis, a name which itself seems to be formed from a pronoun added in front of the Asura name, derived from Varuna/Ouranos. 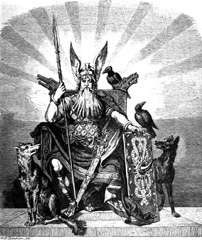 One can then conjecture that Wotan was the leader of a group in southern Sweden (Gotland) who beat the Finns/Kvens, but who also learned magic from them (they and the Sámi to the far north were often noted in the sagas for their abilities with magic - defensive and attacking capabilities rather than simple tricks involving vanishing cabinets, of course). For the same generation of warriors there is also warfare against the mountain tribe in the Jotunheim range, seemingly powerful opponents who are locked in a struggle for regional superiority. 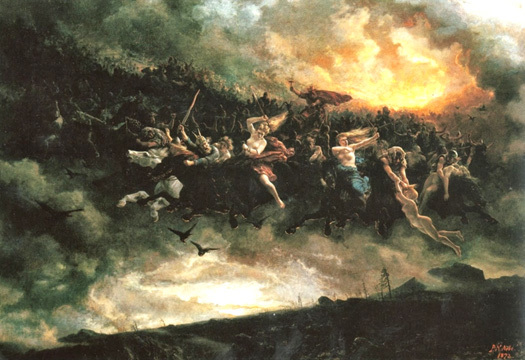 It's almost impossible to precisely place Wotan in chronological terms, but in theory he could well have been responsible for forcing the Jute migration in Asgard's defeat of the Jötnar (the Jutes themselves). It's a lot to take in, but all of this does tie together. Wotan was head 'magician', chief warrior, king, a member of the Goth tribe or group, and he had a band of Goths around him. After battling the regional Kvens and Sámi, and also the rival Jutes and the other (human) tribes, the Goths became the largest and most successful tribe in Scandinavia. See the feature, Origin of Odin, for an in-depth exploration. The word 'troll' appears to derive from a verb to sing and shout and dance, ie. the actions taken when practising certain types of magic. Today we think of trolls as ugly, misshapen creatures hiding in caves or under bridges. But it seems to have originally pointed to magical people. The Norse recorded the term 'troll wife', indicating that a man had married a female magician. Could this have referred to a Kvenish or Sámi woman who was skilled in shamanic magic, as these people often were?. The Celts were dominant across much of central Europe and quite possibly also in northern Germany, lording it over the Germanic groups in the Cimbric Peninsula and influencing those in southern Scandinavia. Text copyright © Edward Dawson & P L Kessler. An original feature for the History Files.